Tony has been very helpful along this journey and taught me so much that I will continue to use for the rest of my driving life. The workbook was very useful. Used some of the videos at the beginning to help me with basic understanding. Tony's Comments: A very competent drive and deserved as Lewis should have passed first time. I wish you well for the future. Tony is very patient and is an excellent instructor. The LDC Workbook and videos are very helpful for practicing in between lessons. A very good first time pass. Tony is a good instructor. He has helped me become a good and safe driver on the road. The videos helped a lot as well because I could watch them in my spare time. The handbook helped me because it gave me chance to reflect on past lessons. 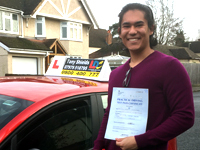 Tony's Comments: Correy is a competent 17 year old who drives with maturity. It was always an enjoyable experience watching him working out and developing his driving skills. 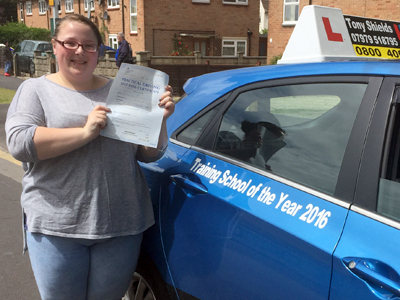 As the examiner said, "a smooth and safe drive Correy and you have passed first time." 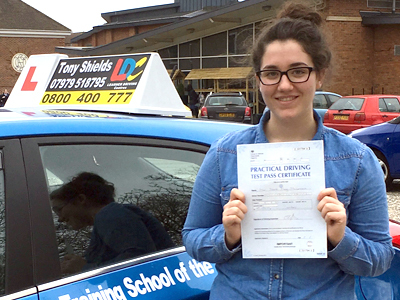 Well done and I am pleased to seeing you on the road already! The LDC System is very good as it allows you to prepare for each lesson, enabling you to get the most out of lessons. 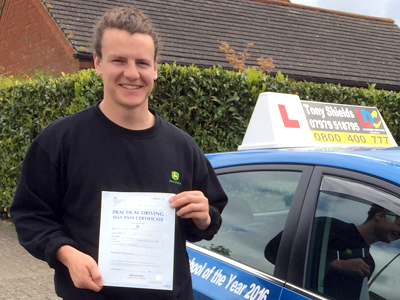 Tony is a great driving instructor, as he is very calm and provides clear instructions. I would very much recommend LDC and Tony to anyone who asks! Makes you feel calm and safe. Tony is a patient and fair instructor. He always has the strongest confidence in you and makes you feel calm and safe. LDC Workbook and videos are very informative and explain things easily. Driving with Tony and LDC has been a pleasure. Couldn't have asked for a better instructor and couldn't have received anymore help. I had a lovely experience learning with LDC and Tony. Coaching element was best way to learn. I found the coaching approach the best way to learn and helped me to drive at my pace. Tony explained and sometimes demonstrated and I learnt more quickly as I learn visually more quickly that way. I passed first time and took 24 hours of lessons. I liked there LD System as it gave me good preparation to visualise the lessons before doing it. I recommend that you go with Tony. First time pass and with confidence! Tony's teaching was amazing, he went at my speed and knew what my weaknesses and strengths were. If it wasn't for Tony I don't believe I would have passed my test with as much confidence and as quickly or as easily as I did. I found the LDC Workbook to be a tremendous help and the videos to be a good learning tool. Only thing I found was there needs to be more insight on the manoeuvres themselves on the videos. Other than that I found the whole experience to be a pleasure and looked forward to each of my lessons. Having struggled with confidence in driving at 18, I began lessons for the second time around last summer. 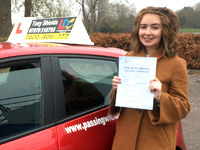 With the help of Tony to concentrate on my control of the vehicle in the present moment, I was able to overcome my anxieties and finally pass my test. The LDC system is broken down into manageable chunks and soon enough you are able to integrate everything you learn into practice. I am so pleased with this result and only wish I'd done so sooner. Thank you so much Tony and LDC. Driving with Tony has given me a new found confidence behind the wheel and taught me all the skills I need to maintain this confidence safely and sensibly. Very happy I chose to learn with Tony! The LDC Workbook was extremely helpful in the final few weeks before the test, helping me to revise all the essential 'Show and Tell' questions. Great instructor, kept me calm and confident throughout my lessons. Would recommend Tony to anyone nervous or feeling unsure about driving. The resources given (LDC Workbook and videos) contributed a lot to my understanding and helped me through the process. Whilst teaching me to drive, Tony has been very supportive, friendly and chatty. He has always made me feel relaxed and this has helped me to stay calm and controlled, even in stressful situations. He gives very good advice and has made the whole process an enjoyable experience. The LDC system helped prepare me for each lesson and was easy to follow and understand. Tony's comment: Garys' examiner said this was a really good drive and it certainly was. Gary overcame previous disappointment to produce this result. Well done Gary! A well deserved first time pass. Tony has been absolutely fantastic! He explains everything very clearly, he is very reassuring and it has been a pleasure being taught by him. The LDC website is extremely clear and useful when studying for the Theory Test, and it's tutorial videos on the practical sides of things are brilliant. Thank you Tony and LDC! 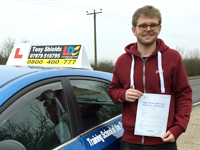 Tony Shields commented: Sam put 110% into his lessons and it was a delight to teach him the LDC system. 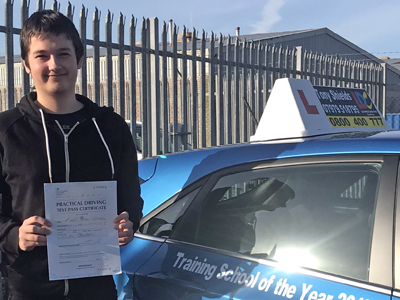 What made this a great result for Sam was that he had to go off to university after completing his semi-intensive course and on his return over Christmas, had a few lessons to bring himself up to speed and then passed with two minors. Have never seen a more pleased student and the pass was well deserved. 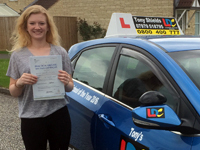 Thanks to Kate Williamson and Tony Shields for helping me pass my test. I have had two instructors over the past year, Kate and Tony. Kate taught me how to drive and I was with her up until my second test failure. I went with Tony as he is my dad (which luckily meant free lessons!). Both were great instructors, patient and understanding. Kate taught me everything I needed to drive a car and gave me the confidence after I failed the first time around. She was very patient, friendly and pushed me to be better and to get over my fears. Tony, my dad, gave me that extra confidence to fine tune everything I already knew. He separated the fact that I was his daughter and treated me the same as any of his students. He taught me how to manage road users, read situations and how to do a 'proper' emergence stop! I was very pleased with the LDC system. It's great for when you are starting out as there isn't a linear structure you have to follow, which meant I was learning things faster than my peers. I didn't use the workbook that much but that was purely for the sake of not having to carry around with me. Everything is online anyway which was much easier. I combined the online theory test material with an app I downloaded which meant I passed first time around. Overall, I'm very glad I went with LDC. I've passed my test with just over year of starting driving lessons and the most important thing is that I feel comfortable with driving as a road user now. I think with other companies it can be quite a shock when students pass as they haven't had the experience as I have had. A big, fat 'THANK YOU'! 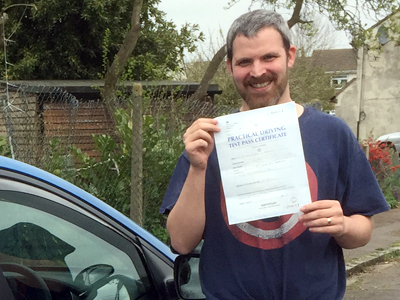 Happy to have passed my test and thanks to a great driving instructor in Tony. He was a very calming presence throughout the whole process. Tony Shields commented: Humphrey deserved to pass and applied himself well. He set himself high standards throughout and got through the disappointments of not getting it right every time! 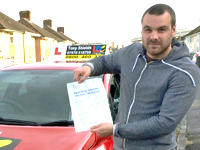 Well done Humphrey for your application especially taking lessons after work when most would like to relax. I was very pleased with the LDC System and felt like I understood this more than the way I was taught with the other instructor. I could not have asked for a better instructor than Tony, he was so calm and patient and explained everything so clearly. I was so please with my experience learning with LDC, I would recommend it to anyone who is learning to drive. 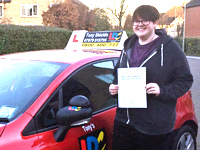 I can't thank Tony enough for helping me pass first time. Tony Shields commented: Hannah applied herself from the beginning and once the nerves settled down she began to take on board the LDC approach to learning with great determination. 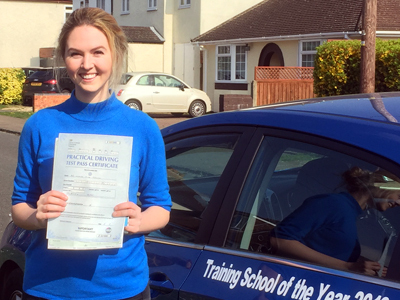 Hannah remained focussed and accepted that we work together as a team to bring her up to driving test standard. Well done Hannah. It was your effort that produced a successful result.